As Paul Michael pointed out in his post Breaking the Bread Code: How to Get the Freshest Loaf, the plastic tabs on bread have meaning, and the colors are fairly standardized within the bread-making industry. Almost unanimously, the color for whole milk caps and labels is red — aside from a few rogue dairies that choose shades of orange or brown — which, light research suggests, is the result of do-as-the-Romans-do-type mentality. I looked up how the red cap started and why it is the preferred color chosen by most dairies, but there’s virtually no authoritative evidence. The same thinking is also applied to 2% milk. Many dairies (but not all, by far) choose a variant of blue — from light to dark — to signify that the milk contains less fat but that it’s not low fat. 1% and skim milk is where the non-standardized system gets tricky. eHow claims that green is the color of choice of most dairies for 1% milk, while skim milk generally receives a purple cap. Except that’s not always the case — not even close. In fact, the 1% milk in my fridge, from Market Pantry (a Target brand), is yellow. All hope is not lost, though. 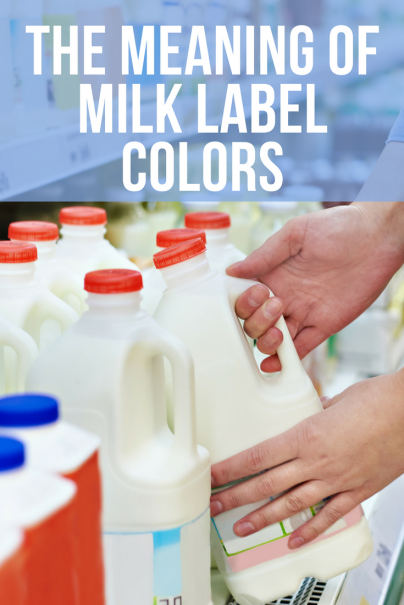 Take a look at this milk-label color-scheme standardization chart compiled by amateur milk-color-code investigator Shawn Brenneman, author of the blog startled. He compiled the milk-cap colors for the four most popular milk types — skim, 1%, 2%, and whole — from 33 popular dairies. As I mentioned, most of the whole milk caps were red, but lessen the fat content in the milk and a seemingly random rainbow of colors appear. There’s 2% with a red cap from Mayfield (which uses brown for whole milk), a purple cap for 1% from Alta Dena, and a green cap for skim from Sunnyside. What’s even more interesting is that some brands — like Trader Joe’s — don’t distinguish their organic and non-organic skim milks — both receive a light blue cap — which can be deceiving to shoppers, especially those in a hurry. Seems like a well thought-out solution, considering that many dairies are already on board with these colors choices for the various types of milk. With such a seemingly easy problem to solve, why hasn’t it been standardized yet? I believe you're looking for a problem where there isn't one. The idea of a color code standard for the milk industry seems absolutely pointless. Unlike the bread code, which give buyers cues about baking dates which is otherwise absent in writing, milk cartons have large, clearly printed labels that tell you what type of milk you're buying. While a color standard may save consumers a few seconds, it may negatively impact company sales who want to differentiate its commodity from competitors. Also, consumers could pick up the most expensive bottle of milk inadvertently. I say if you're buying milk based only on a cap color, you're not being a wise consumer.